As many of our readers and supporters will know, we’ve got a great deal lined up with Raidlight, who are one of our Ultra168 Partners and part of the Supporters Club initiative that can save you a whopping 30% off all of their gear range. (See more details here). As part of finding out more about their range, we’ve enlisted the help of some of our Supporters to review some of their gear so that it’s not just me telling you about it. We have impartial runners, testing gear for themselves to give you the real low-down on what it’s really like so that you the reader can make informed decisions for yourselves. This time around, we enlisted the help of Sydney ultrarunner, Tanya Carroll. 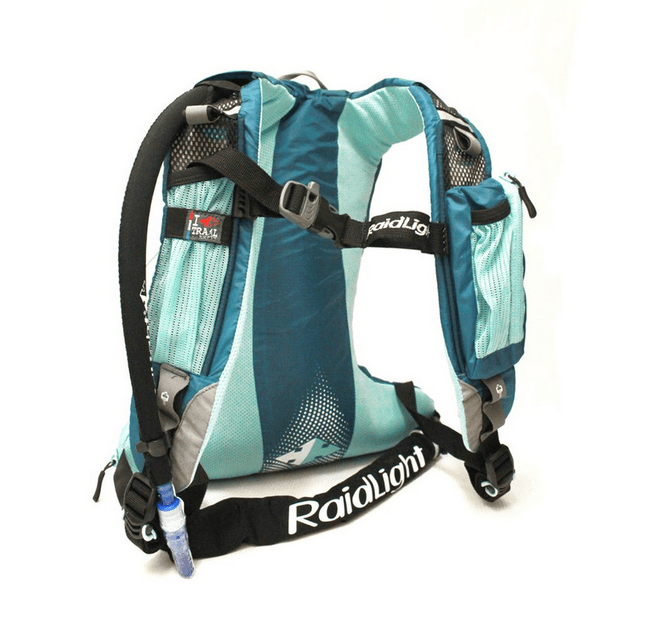 She expertly helped us test the Raidlight XP2 Ladies Hydration Pack and I’ve added her notes below. As usual, I like to keep the review in its raw format rather than do any editing, so take a look at the below. Remember, if you’re an Ultra168 Supporter, you can get 30% off these packs, which means a saving of $40. The RRP is $135, bringing the cost down to $90. If you’re keen and after more info on this pack – click here. I found this pack surprisingly comfortable – I was a bit skeptical at first given I hadn’t heard too many people talking about these packs, but didn’t notice any lack of comfort compared to my usual Salomon Slab12. The pack has soft mesh on all parts of the pack that touch your body, with the exception of one panel of polyester down the middle of the back section. It sat in just the right place across my shoulders and had two straps across the front to adjust the fit. The bottom waist strap had a cover over the strap which added to the comfort and also meant you had somewhere to tuck the excess strap back into. The chest strap could also be moved vertically up and down so you could position it where it suited you and your body shape. It didn’t seem to affect the comfort for me but I did note that the two front straps are not elastic like some of the other packs have these days. They did have easy release clips though. The straps that you pull down on to tighten the pack against your back also had little loops on them. This enabled you to roll them up and then hook the loops onto specially designed hooks. This again stopped the excess strap from flapping around – something that usually drives me crazy. The pack was fairly light at 310g. The bladder holds 1.5lt of fluid and has a large round opening with the screw in lid. The lid is attached so there is no chance of losing it, but it could be a bit ‘fiddly’ to screw in if you were in a hurry rushing through a checkpoint. There is a good-sized opening allowing easy access to refill the bladder without having to pull it out of the pack. One of the main drawbacks of this pack in my opinion is that there are no front pockets to put other bottles into. This is something that would limit the use for a lot of people who want to keep water in the bladder and their own electrolyte drinks for example in the front. (Other packs in the range do have front pockets – (see here). 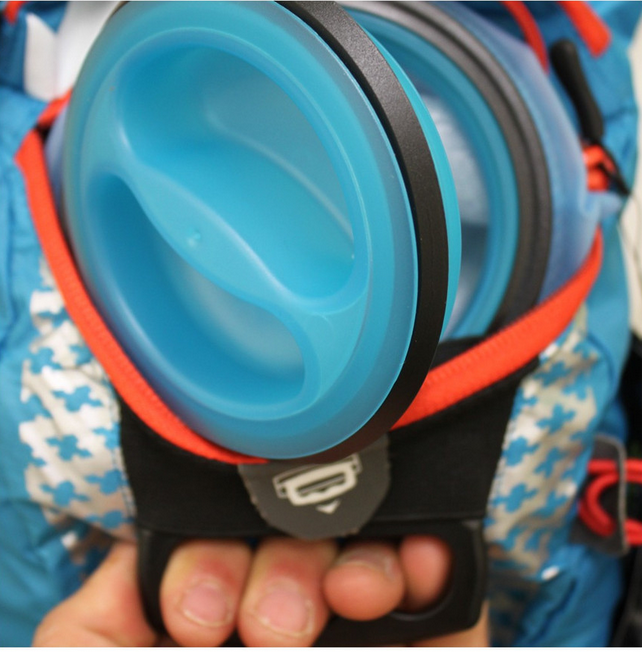 It does have one deep mesh pocket on the back of the pack which is designed for gear or poles, but could fit a large bottle. However unless you had super bendy arms (I don’t) then you would have to take the pack off to get the bottle out. Other than the main pocket that the bladder is in, there is only one other pocket (not zipped) for storage of bulky items such as clothing. While it could fit a couple of items such as a fleece or jacket, it definitely wouldn’t fit all your mandatory gear for a race such as TNF100 for example. This same pocket, is also designed so it can hold poles, and there are elastic bands to keep the poles tight. In terms of small pockets, there are a few. One small one at the very top which could fit something like a snake bandage or two. There was a zip pocket on the front shoulder strap which could hold your gels or electrolyte tablets/small food items. On the other shoulder strap there is a mesh pocket that could hold gel packets or at a stretch a gel flask. There is an elastic band across it which is very tight, so it would have to be a small container. There was one bottom pocket where the zip ran along the bottom edge of the pack, something I haven’t seen before. It could fit a lightweight rain jacket or similar. You would definitely want to make sure this one was zipped back up properly as otherwise the contents would be scattered along the trail. Finally there was also a zip pocket on one side of the waist band, which is designed for your phone or Ipod. It comes with a cable that can plug into your phone, runs up through your pack and then you can plug your headphones into it at the top. Definitely not something I’ve seen before. I carried my phone in the pocket and found it comfortable and it didn’t move around or dig into my waist as some can do. It is a very comfortable, fairly lightweight and well padded pack. It’s main use I think would be where you don’t need to carry a lot of gear (summer races, shorter ultras) and where you are happy for your hydration to come from the back bladder without the need to carry additional bottles.